Home / Aquino Family / Cory Aquino / Jojo Robles / Kris Aquino / Noynoy Aquino Brother / Noynoy Brother / Sen. Ninoy Aquino / Viral Stories / Jojo Robles Expose: "Noynoy Aquino Has a Brother, Whose Mother is Not Cory Aquino"
Jojo Robles Expose: "Noynoy Aquino Has a Brother, Whose Mother is Not Cory Aquino"
Veteran journalist and political analyst Jojo Robles madee an explosive expose on social media as he revealed that the former President of the Philippines, Pres. Noynoy Aquino has an alleged brother, whose mother is not Cory Aquino. 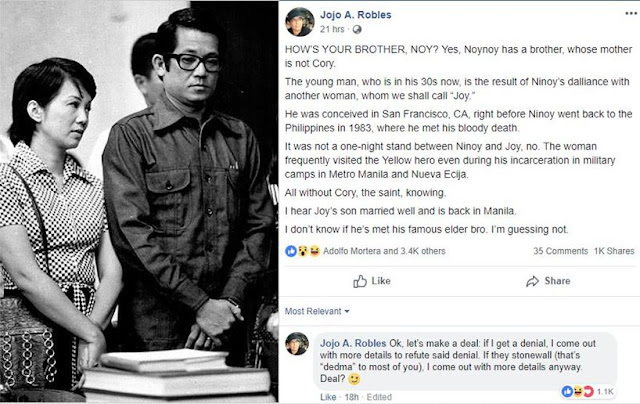 Trusted journalist Jojo Robles revealed his expose by asking Noynoy Aquino the current situations of his brother who is now in his 30s according to the verified information at the hands of Robles. Jojo Robles noted that the young man is the result of Ninoy Aquino's alleged dalliance with another woman whom Robles call the name as "Joy." The alleged son of Ninoy Aquino was conceived in San Franciso, California in the US, right before Ninoy went back to the Philippines in 1983, where he met his bloody death. The journalist added further that the relationship between Ninoy and Joy was not just one-night stand, because the woman frequently visited the Yellow hero even during his incarceration in military camps in Metro Manila ang Nueva Ecija, all without the knowledge of the late Cory Aquino. The alleged Ninoy's son is now back in Manila according to Robles but he is not sure whether Noynoy Aquino have already seen his estranged brother. "HOW’S YOUR BROTHER, NOY? Yes, Noynoy has a brother, whose mother is not Cory. He was conceived in San Francisco, CA, right before Ninoy went back to the Philippines in 1983, where he met his bloody death. It was not a one-night stand between Ninoy and Joy, no. The woman frequently visited the Yellow hero even during his incarceration in military camps in Metro Manila and Nueva Ecija. All without Cory, the saint, knowing. I hear Joy’s son married well and is back in Manila. I don’t know if he’s met his famous elder bro. I’m guessing not."